I’m retired/disabled, so I consider myself a full-time pet mommy and part-time novelist. I was in printing and marketing for almost 15 years, so I feel that I have a good grounding in the basics, which can make me a bit of a grammar snob. I home-sew, quilt, knit, crochet, and do counted cross-stitch. I do volunteer projects for local charities. My Jewish faith is a big part of who I am, and I like to include a Jewish theme or character in every book, but sometimes, such as in Commune, it’s just not possible. I enjoy humor, historical fiction, and what I like to call “ensemble fiction.” I’m also in the right age bracket for the new genre, “boomer lit.” I have a small, non-fiction short story about my years as a typesetter, but non-fiction is typically not my bent. 2. What do you think about when you’re alone in your car? That you can do it alone; you don’t need to wait for someone else to show up for it. But networking online with fellow authors is great fun. What a gang!! It’s the non-writing part, the marketing, that gets to me. I haven’t yet found the magic bullet that will place me before the appropriate audience. 5. Pick two celebrities to be your parents. Who would they be and why? I was raised in unusual circumstances, so I have no idea what an ideal family should look like. I wouldn’t know who to pick for parents. 6. Where do you get the ideas for your stories? They just come to me. I’ve lived in lots of places and have had a variety of job experiences and personal relationships. It all sneaks in there. 7. Tell me about your ideal reader. It’s funny, but I’ve found that men seem to respond better to my books. They get the humor and appreciate that the male characters are written in three dimensions, not two. Women sometimes don’t get the humor. That surprises me, but it’s interesting that people can have opposite reactions. My books make people think. 8. What is your “go to” routine that helps you get in the mood to write? Special beverage? Music? Etc. I hate to sound dry, but I just sit down and do it. 9. Tell us about your next book & when is it being published? I am about to put one of my ebooks, Triptych, into print. But my next “oeuvre” will be another historical fiction. I’m still in the research stage, but I’m looking forward to it. I don’t have a working title for it yet, either, but it will be another strong story. Links to Java’s website, blog, books, etc. Java Davis. I love connecting with people on Goodreads. 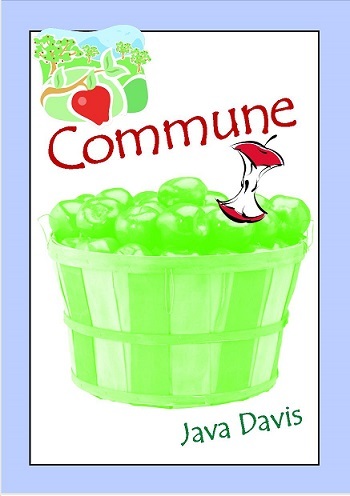 BE SURE TO COME BACK to read more about Java and her book, COMMUNE, on Wednesday’s Karen’s Killer Book Bench. Happy Reading! **SPECIAL ANNOUNCEMENT: Java will give away her audiobook, DEPRESSION CARPENTER (read by Justin D. Torres), to TWO readers who comment on her Monday Interview or Wednesday Book Bench blogs. **You must specifically state you want to win a copy to be put into the drawing. ** Don’t miss this chance to read this story. Thanks, Java, for sharing your story with us!